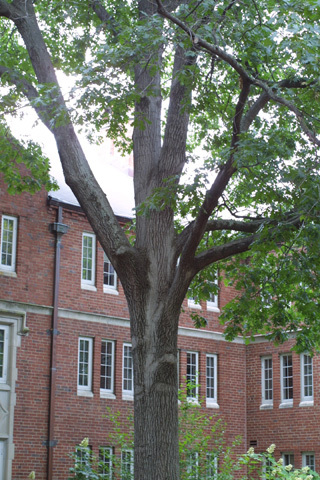 The entry sidewalk of Cole Hall is flanked on both sides by a pair of large Shumard oaks. This one is the one on the right. Shumard oak is another member of the red oak group. Its leaves are quite similar to those of other members of the group. One identifying feature is the lack of hair on the bud scales when examined under a hand lens. The twigs and acorns also tend to be covered with a grayish waxy layer. Shumard oak is fairly common in middle Tennessee. It tends to be found in moist lowlands. A similar species, Quercus coccinea (scarlet oak), is more likely to be found in dry uplands. There are several Shumard oaks in this part of campus. This one actually has a name: "Big Al". It is described on p. 62 of The Trees of Vanderbilt. This organism is a living specimen that is part of the  Vanderbilt University Arboretum  with the local identifier 3-196. It has the name "Big Al". Remarks: Tree nicknamed Big Al.